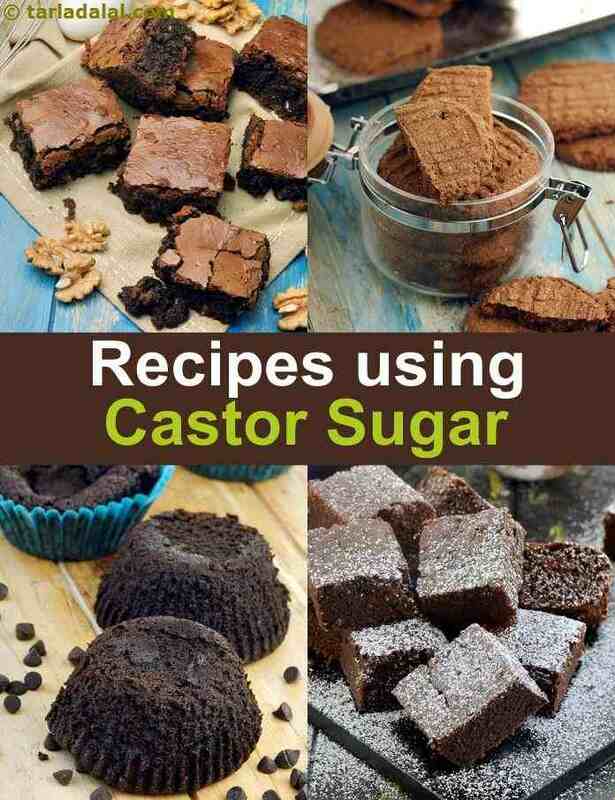 Castor Sugar Recipes, Castor Sugar Recipes for Baking. Castor sugar is a type of refined sugar that is mainly used in baking confectionaries like cookies and cakes. The only actual difference between this sugar and our regular granulated sugar is the size of the grain. Regular granulated sugar has a larger grain, powdered sugar has really tiny grains that cannot be separated by the naked eye but castor sugar is somewhere in between. It is preferred to be used in baking as it dissolves easier and has a lighter texture as opposed to regular sugar. As we know, castor sugar is used mainly for desserts as it dissolves easily and creams well. There are so many types of desserts that can be made with this amazing ingredient. Banana Chocolate Loaf is one such amazing recipe that will blow your mind. The soft sponginess of the cake with a hint of banana flavor is something you have to experience! Another recipe where castor sugar works fantastic is Chocolate Chip Cookies. It is because of this sugar that there is a certain chewiness to the cookies! Instead of using it in recipes, you can use this ON certain dishes! Combine castor sugar with cocoa powder, cinnamon and coffee powder and dip warm Cappuccino Doughnuts in them. These treats will be loved by kids and adults alike and you wouldn’t even mind eating it for breakfast! Due to the fine grind of the sugar, it makes an ideal ingredient for the ever popular Crème Brulée. The ingredients are all combined together to make a pudding which is then topped with delicious sugar which is then caramelized. Apart from the usual baking, castor sugar is also used in recipes that do not require any sort of baking or sometimes even cooking! Thai cuisine has a very unique dish in their repertoire which is Thai Stir Fried Noodles. These noodles are stir fried with vegetables and then tossed in a slightly sweet peanut sauce. Here the peanut sauce uses castor sugar as it dissolves easily and does not leave any grains, resulting in a smooth sauce. Just like that, it is also added to a Thai Cucumber Relish to give it a rich sweetness. When you think of biscuits, the first thing that comes to your mind is sweet biscuits but in India we also have Jeera Biscuits. These appetizing, slightly sweet biscuits have a unique roasted cumin taste that comes through beautifully. If you like this, then do scroll down do get more Castor Sugar Recipes, Castor Sugar Recipes for Baking.